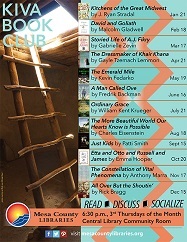 Join us for our next Kiva Bookclub, at 6:30 pm on Thursday, July 21st, in the Central Library Community Room, as we discuss Ordinary Grace by William Kent Krueger. There is no registration required for this event. To find a copy of Ordinary Grace, search our catalog. See you there!